Birman cats are beautifully marked felines with gentle, playful personalities. If you think this sounds like the perfect pet for you, you'll love learning about the fascinating origin and characteristics of this charming breed. It's commonly believed that the Birman originated in Burma. It was a special breed that was considered sacred enough to be companions to the Kittah priests. Although information about the actual origins of the Birman cat is difficult to find, it is known that a pair of cats were shipped from Burma to France in the early 1900s. Back then, voyages were long; it could take several months to cross the ocean. The male cat did not survive the journey, However, the female not only survived but actually gave birth to a litter of healthy Birman kittens in France. Although the French cat registry recognized Birman cats as a breed in 1925, they largely died out during World War II. By the end of the war, only two known Birmans were left alive in all of Europe. This meant that breeders had to establish a program of outcrossing to reestablish this beautiful breed. Outcrossing is the process of breeding a different breed to the desired breed of cat. Once another breed is introduced to the gene pool, most cat registries require five full generations to be bred before they will accredit a breed. Due to this requirement, Birmans were not recognized as a breed again until the mid 1960s. The first Birman cats arrived in the United States in 1959. 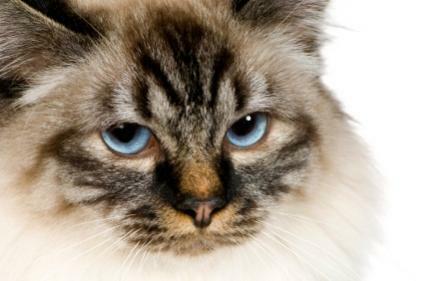 The Birman has a strong, intelligent face with round blue eyes. The feet should have white socks, and each should be symmetrical. The Birman has a gentle personality. It seems to take its cues from its owner and is playful when there is time for play, but it's quiet when the owner is busy or preoccupied. These cats are social animals and don't do well as the only pet in a home, especially if the house is empty during the day. If you are considering a Birman then you should plan on getting another animal as a companion if you don't all ready have a pet. Another Birman is great, but adopting a cat from a shelter will do. Even a dog is usually fine with the Birman. The Burmese is a medium-sized cat. While its body is muscular, it does not have the stocky look that a Birman cat has. The cheek bones of the Burmese are tapered and end at a blunt wedge right at the nose. Most obviously, the eyes of the Burmese are yellow, and the coat is short. There is a French tradition that all of the Birman kittens born in any given year will have names that all begin with the same letter. According to this tradition, for example, all Birman kittens' names should have started with an "H" in 2010. No letter of the alphabet is skipped, so the letters are repeated every 26 years. This tradition is followed in many catteries around the world. Of course, you can name your kitten anything you like. Since this is an unusual breed, you may have to search a little farther than your hometown to find a breeder. One of the quickest ways to find a reputable breeder is to check with Sacred Cat of Burma. The site offers a breeder referral program that can point you in the right direction. Not only does this site list breeders, it also helps place older Birman cats that may need to find new homes. If Birman cats are the pet of your dreams, you may need to be a little patient. You may even have to pay a bit more money than you would for some of the other, more common breeds. However, the wait and the expense will be worth it if you love this breed,.